Richmond-upon-Thames is a funny place; it’s a suburb that rejects its own designation, a place with proper snobbery rather than mere airs and graces. While Wimbledon and Walton, smug though their neat semis might seem, have a certain Edwardian insecurity to their ersatz village-greenery, Richmond has both the aristocratic amour propre of the more bijou county towns and the metropolitan superciliousness of Notting Hill. It’s a utopian bubble in London’s sprawl, a place that is equal parts Georgiana and Art Deco, an English Heritage aesthetic in league with an iPhonian élan. Little illustrates this better than the view from the ultra-chic restaurant of the Richmond Hill Hotel, where a number of correspondents, PRs and indeed Apollo bloggers have gathered to hear Professor Michael Rosenthal speak about ‘Turner and Constable: Sketching from Nature’, an exhibition coming soon to Margate’s Turner Contemporary that he has curated from the vaults of Tate Britain. Since J.M.W. Turner painted here in the early 19th century, very little has changed; on an atypically pretty September afternoon in 2013, three austere but nonetheless attractive tower blocks are the only suggestion of the intervening centuries – a straight run from Beau Brummell to the Barbican, to paraphrase Britpop group Saint Etienne. ‘From 1792 to the fall of Napoleon,’ Rosenthal says, ‘artists were confined to Britain – the war made the Grand Tours impossible’. What Rosenthal refers to as ‘Naturalistic landscape painting’, then, became ‘unusually prominent’. Tied to London out of economic expediency, many of these painters – among them Peter De Wint, John Linnell and Turner – frequently settled for what views the capital’s environs allowed them. 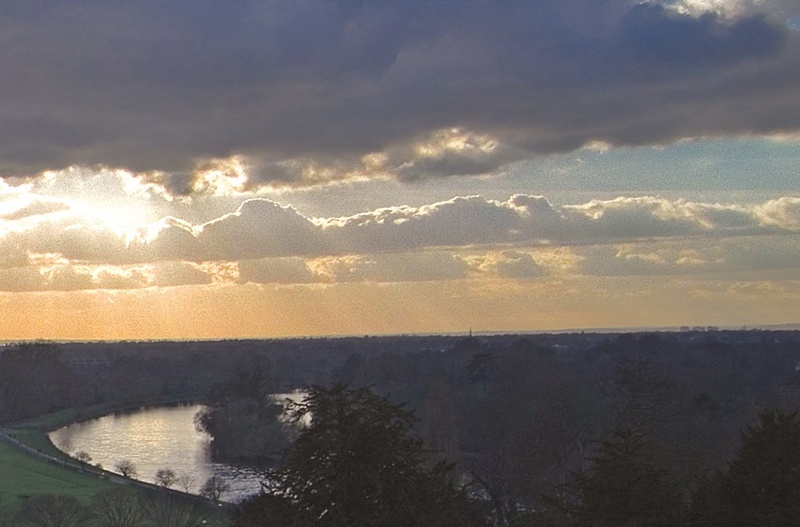 The Thames thus became ‘Britain’s Tiber’, and the course between Richmond and Hampton Court was a particularly popular stretch. Even now, it feels somewhat improbable that the landscape as seen from the top of the Hill is within 10 minutes’ walk from a Tube station; as Rosenthal confirms, ‘It was very convenient, and even then an extremely desirable area to live’. Turner’s View of Richmond Hill and Bridge – first exhibited in 1808 and included in the Turner Contemporary exhibition – is a perfect example of how landscape in British painting of the period became more than mere context. As one contemporary reviewer commented, ‘The indistinct distance of mingled groves and edifices… leaves us the imagination to wander over Richmond, and finish the picture from the suggestions of the painter’. The blurred figures in the foreground are just window dressing, the real hero here is the Bridge, ‘a signifier of the civic works which quietly proclaim the civilised virtues of the English’, as Rosenthal writes in the exhibition catalogue. If it can’t openly be called propaganda, it’s nothing if not loaded. This extraordinary period in British painting was not to last, though; by the mid-1820s, the subject was once again the dominant theme, a reversion Rosenthal dismisses as ‘kitsch’. What we might anachronistically call the ‘white heat’ of the second scientific revolution and the wars with France cooled significantly, congealing prevailing trends in art to nostalgic, sentimental mush. Nonetheless, as Rosenthal states ‘for a moment, landscape in Britain became truly revolutionary’; the adjective is not used lightly, making it all the more peculiar to think that Richmond – where a Quinlan Terry development now sags around the banks of the river – could ever have been associated with it. ‘Turner and Constable: Sketching from Nature’ is at Compton Verney until 22 September 2013, and Turner Contemporary from 5 October 2013 – 5 January 2014.